When buying emeralds, there are three characteristics to be considered: Clarity, Colour, and Intensity. What are the recommendations for buying emeralds? Clarity: emeralds are not known for being flawless. Their inclusions are not defects, rather proof that they are authentic. Generally, there are two types of inclusions: “moss”, cluster of moss. In the latter case, it is referred to as a jardin, the French word for garden. 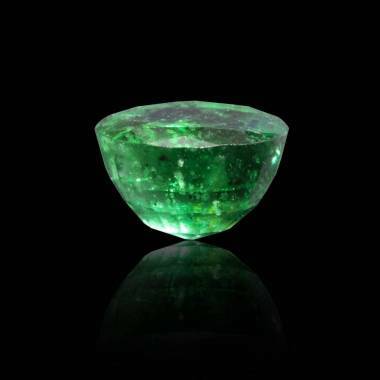 These are natural elements that are present in emeralds and do not have a major impact on their value or quality unless the inclusions are quite deep. Colour: The more intense the colour is the higher the cost will be. Thus, a pale green colour will be very inexpensive. Note that colour enhancement treatments do exist. Learn about these enhancements on our page for colour-treated-precious gemstones. The most expensive emeralds are grass green and are exceptionally brilliant. It is also necessary to know that emerald green saturations vary from faint to very dark with intermediary hues of yellowish green or light blue. Colombian emeralds are said the most beautiful, however the fact remains that beautiful green gemstones do exist in other regions. Jaubalet Paris therefore offers a wide variety of high quality emeralds available to buy online. All of which certified by international gemology laboratories. In addition, Maison Jaubalet offers assistance online from its experts who provide you with expertise to purchase your emeralds.